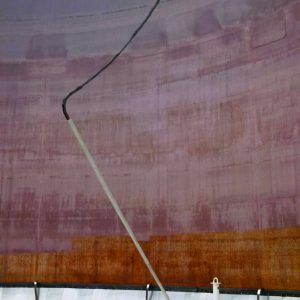 The MAGS® (Movable Arm Grounding System)™ by Lightning Master® is a patented bypass conductor system for external floating roof tanks. It meets and exceeds the requirements of the American Petroleum Institute API 545 and the National Fire Protection Association NFPA 780, and is ATEX Certified. It is a simple, reliable, gravity-powered system, and has been thoroughly wind tested in excess of 2,000,000 cycles without wear or failure. MAGS® is easy to install, and has a worldwide base of trouble-free installations. Unlike some other systems, MAGS® is certified for installation in a Classification 1, Division 1 area. About 30% of tank fire and explosion incidents are due to lightning. EFR tanks are particularly vulnerable to the effects of lightning because of the isolated floating roof. A direct or nearby lightning strike will cause a difference in potential between the floating roof and the tank shell, which, if not properly bonded can be an ignition source.